This photo showed up in an earlier post. The arbutus tree is gorgeous, etched elegantly against the water and distant shores. But did you notice that dried out section of tree near the bottom of the photo? Tree rings and layers, texture and colour fill each crevice of wood. Weathered, twisted wood, beautifully intricate. 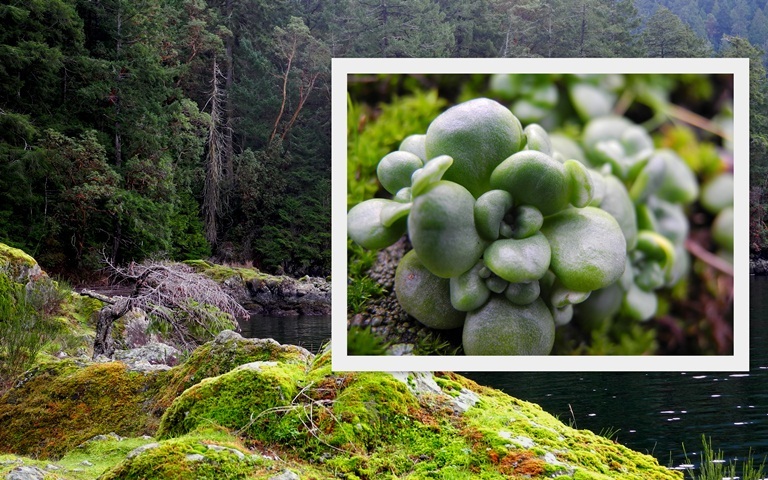 The plant in the inset photo grows on the rock in the foreground of the larger photo. It would be easy to walk by and not see the succulent leaves, the pattern of two opposing leaves, or feel the smooth texture. Having my camera has helped me to slow down a little outdoors, to take the time to bend down, to look and to see. Linking with Mary of the Little Red House to Mosaic Monday. I liked having a closer look at this tree as it's not to found around here. The colours of the wood are so subtle and beautiful. I couldn't help but think how those shades would be so lovely knit up in a cosy sweater. Lovely poem and the camera is the perfect tool to make you slow down and enjoy all the magic around you. Have a blessed week. The Arbutus - it's a magical tree to me, and I can't pass one by without stroking it's trunk. Wonderful! I've never read that poem before, but I really like it. I love the close up of the dead trunk, especially that second one with the rust color against the gray. Love the little succulent, too. What a great place you have to enjoy nature and take some photos. I'm now following. I remembered that great tree and happy to see it again! The inset photo is a great idea; I wish I knew how to do that. I just wanted to come back and tell you how much I've enjoyed my visit. I've looked back over several pages. I think we have several things in common. My mother used to make 7 minute frosting for my birthday Devil's Food cake. I have a sister, too, that is very different from me. She's a world traveler, I'm a homebody. I think think the way you make your birthday special is fabulous! I'm glad I found you, I for sure will be back. BTW, I watched that embroidery video, it was awesome. I do a little on my crazy quilt squares that I'm doing. I think we have that in common, too. I love the poem. It has become easier as the years have passed to slow down had find the small things that bring so much joy. Having a camera ever ready is also wonderful. Have a wonderful week. It is a beautiful tree and a lovely scene! Very peaceful. The poem is perfect, thanks for sharing. Nature is beautiful and your mosaics are wonderful. Wishing you a happy week ahead! Perfectly wonderful... Your photography is, as always, lovely. No, I probably never would have slowed down enough to see the little succulent growing there, not even with my camera. I'd be too busy looking at the bigger picture. Hmmmm...I'll have to remember to do both. Perfect poem to complement your thoughts. The arbutus is wonderful. I’ve tried growing one several times but each one has died on me. Wonderful to connect the poem with your nature pictures. A beautiful poem Lorrie and stunning photo of the arbutus!! Ahhh...the west coast! You are right. There is so much to see when we stop to look. This is a perfect match for my serious post as there is so much to feel and share if we stop to do it!! Love the new profile photo!! You really do take amazing close ups! It's so nice to see the details...just as if we were right there with you! Happy Monday! These are wonderful pictures. It really does help to take time to enjoy things when you have a camera in your hand. At least it does me as well. wow I love the red colour of that tree trunk. One of the wonderful things about photography, and macro, is it shows you things you might not have seen. The patterns of plants are so beautiful and intricate. Have a wonderful week. I am linking up to you through Mosaic Monday. Your photos are beautiful and I love how you did the mosaic. Fabulous, all of it, the photography and writing! Beautiful images. I look forward to seeing you at My Dream Canvas. That is an amazing tree. Almost looks like someone has painted it.